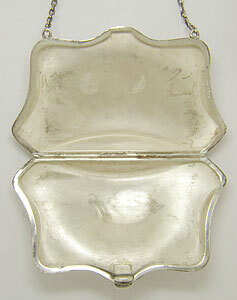 Engraved foliate designs decorate the front and back calling card case of this antique sterling silver chatelaine. 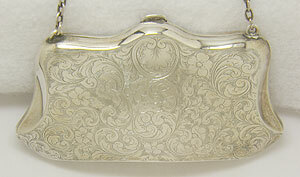 The top hook is crafted in the shape of a fleur-de-lis. 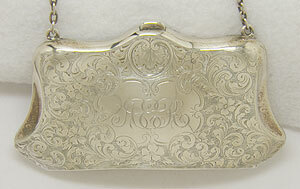 The front of the calling card case is engraved with initials that appear to be “AER”. The case measures 4 1/2" in width, 3 3/4” in height and approximately 1” in depth. With the chain, the piece measures 12” in height. Circa: 1898.